Research team from Chain Reaction Innovations Cohort 2 harnesses Center for Nanoscale Materials power to explore emerging materials for energy-efficient computing. The demand for computing power continues to accelerate with each passing year as consumers grow ever more reliant on smart phones and the data centers that keep them functional. Chad Husko, a physicist specializing in nanoscale optical materials and devices, believes advanced laser technology is critical to fulfilling this growing need. Husko, formerly the Alexei Abrikosov Fellow at the U.S. Department of Energy’s (DOE) Argonne National Laboratory, said the search for silicon-based light sources evolved from a scientific quest to alleviate a major technological bottleneck for scalable, complementary metal–oxide–semiconductor light sources. 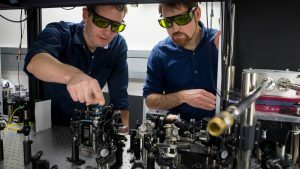 In an effort to help solve this problem, he currently leads a research program on hybrid silicon lasers that he hopes will harness emerging materials for applications in silicon photonics for energy-efficient computing and data centers. He and his team were selected in 2018 to participate in a competitive two-year program called Chain Reaction Innovations (CRI) to grow their invention. CRI, funded by the DOE’s Advanced Manufacturing Office, gives innovators a two-year runway to develop and scale their technologies while being supported through fellowship funding that covers salary, benefits, and use of laboratory equipment and office space.